Yes, it is true. I wrote articles for Contending for the Faith, edited by Ira Y. Rice, Jr., in the late 1970s. Ira Y. Rice, Jr. was a good friend of my father Mark N. Hicks. Ira would stay in our home, it seemed, at least once a year. He would either hold a meeting or at least speak on a Sunday evening or Wednesday evening when he visited. Sometimes he was raising money for Far East missions as he encouraged missions and evangelism, and at other times he was warning the church about the inroads of liberalism within the brotherhood. I rememberd him fondly because he would always leave a dollar in my shoes when he visited. My relationship continued with Ira in the late 1970s. I invited him to hold a meeting with the NE Philadelphia Church of Christ (Philadelphia, PA) in Fall of 1978 (I think that was the date). We spent quite a bit of time together those few days, and I remember he warned me about attending Westminster Theological Seminary. I attended Westminster from 1977-1979 when I was 20-21 years old. As I think back my camaraderie with Rice was a mixture of naivete, influence-seeking, and shared convictions at many levels. I was naive about the politics of the church. I sought a measure of influence and power within the “brotherhood”–and Rice was a clear power broker as well as a family friend. And I did share some basic theological viewpoints with him. The two articles below certainly make that clear. Ultimately as my perspectives changed–though they changed rather slowly–we parted ways. When I began teaching at Harding University Graduate School of Religion in 1991, our fellowship was fully broken as he regarded the Graduate School as a troubler in Israel. One would only need to scan issues of Contending for the Faith to see his animosity toward the institution because he believed it was a threat to the church as he understood it. Ira was passionate. 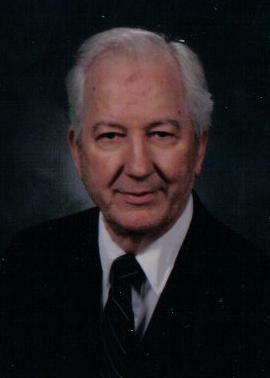 He promoted missions in many local churches across the country. He advocated the desegregation of our educational institutions when it was anathema to many, rebuked Foy E. Wallace, Jr.’s racism (Rice was the young preacher who slept in the same bed with R. N. Hogan), and he wanted concrete congregational unity between white and black churches. In terms of racial progress, he was one of the few on the progressive edge. This is one of the dimensions that he admired about where my father preached for years in Alexandria, Virginia–it was a congregation of Koreans, African-Americans, Hispanics and Anglo-Saxons. Ira certainly had his faults and sins as we all do. I cannot nor will I judge the man but neither will I sanction all that he did or said. I may disagree with him theologically and with some of his strategies, but I can still appreciate the righteousness of some of his causes. The two articles below indicate that at one time, however, I shared some of his most cherished convictions: (1) the authority of elders and (2) the sanctification of the believer by the Spirit through the word alone. “The Lordship of Elders,” Contending for the Faith 10.3 (March 1979) 9-10. I originally submitted this piece to the Firm Foundation as a response to an editorial by Reuel Lemmons but he declined to publish it because there had been too many articles on the subject at the time. So, Ira published it. The article is negative in tone and intends to demonstrate that 1 Peter 5:1-3 does not undermine the idea that elders have “positional” (official) authority, that is, they have ultimate authority to make decisions about expedients for a congregation. The stress on “positional authority” is an idea that lingers from my book on women’s role in 1978 where it is argued that men have “positional authority” over women (I’m inwardly cringing as I type). Nevertheless, there are still some good exegetical points in the piece–“lording it over” is a form of tyranny. Unfortunately, I did not have the wisdom or experience to see that tyranny is often expressed under the guise of “positional authority” over expedients. 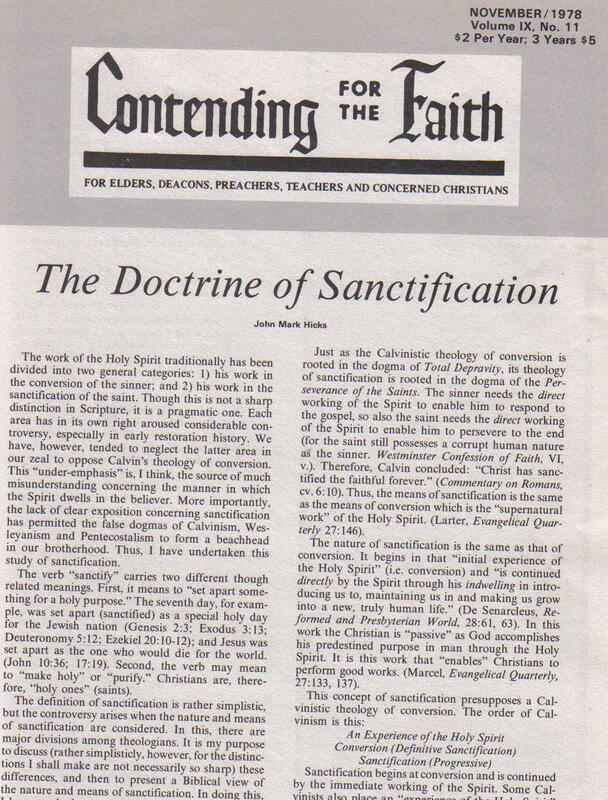 “The Doctrine of Sanctification,” Contending for the Faith 9.11 (November 1978) 1, 3-6. This is an unusally lengthy piece for Contending for the Faith. It was partly the result of a research paper at Westminster Theological Seminary but I turned it toward specific issues among Churches of Christ. After surveying Calvinists, Wesleyan and Pentecostal versions of sanctification, I offer my own “biblical” version. My understanding of sanctification, however, only involves the mediate work of the Holy Spirit through the word. I deny the personal indwelling of the Holy Spirit, deny the “enabling” work of the Spirit in the life of the believer, and deny any direct work of the Spirit on the heart of the believer. Rather, since sanctification is through the word, the indwelling of the Spirit is also through the word. As I read it again, I was struck with how much my “logic” jumps from one thought to another, from one text to another. I draw conclusions from and string texts together in ways that are quite troubling to me now. My hermeneutical models and practices were still quite emeshed in traditional proof-texting. Also, I now recognize that my analysis of Wesleyanism in particular was quite superficial and at times just plain wrong (e.g., indwelling Spirit only comes through second work of grace in perfectionism….NOT!). What I did have right, I think, is how the Pentecostal Holiness movement substituted the experience of Holy Spirit Baptism for Wesley’s Holy Spirit experience that enabled his version of Christian perfection. While some of the historical details are correct, the conclusions I draw and the projections I place upon Calvinists, Wesleyans and Pentecostals are prejudiced by my objective in the piece. This entry was posted on March 15, 2009 at 8:39 pm	and is filed under Personal, Theology. Tagged: Authority, Church Organization, Church Polity, Elders, Holy Spirit, Indwelling of the Holy Spirit, Ira Y. Rice, Jr., Leadership, Pneumatology, Polity, Sanctification, Scripture, Shepherds, Word. You can follow any responses to this entry through the RSS 2.0 feed. You can leave a response, or trackback from your own site. Just curious, what was it like to study at WTS when your theology not only would have differed from them in many ways? There is something healthy about ferreting through your past, trying to make sense of it and accepting what is. Then you can say, ‘that was me then; this is me now.’ Thank you for sharing some good things about Ira Y. Rice. I appreciate you for that. I like who you have become. This is fascinating to me, especially to note your admiration for Ira Rice’s strengths while acknowledging weaknesses. The comments about trying to impress a brotherhood power broker were especially poignant, since I remember feeling some of that pressure myself as a young preacher in the 1970’s. Thankfully, that position of “power broker” is disappearing among most brethren I know and I hope the same is true among those I don’t. I suppose that Rice, as all of us, was a mixture of commendable qualities and misconceptions. As you can imagine, I have mixed feelings when I read of your evolving approach the scriptures. On one hand, I am happy that you have moved away from the sectarianism of those like Ira Rice, but of course, fear that some babies have been thrown out with the bathwater. I was glad to read about Rice’s call for desegregation. And so early on. It’s tempting for us to make pariahs out of some of our foreparents. I think that’s wrong. Not to mention that the next generation is watching, learning how to treat older people. Many years ago, the late Foy E. Wallace, Jr. preached a sermon that broke me of my habit of getting into school-yard cussin’ contests, wishing I could win. Maybe I’ll write about that sometime. In his book on Restoration History, Richard Hughes has told the story: when Ira Rice came to Connecticut to study Mandarin Chinese at Yale, he was appalled at how non-traditional the Whitney Avenue Church of Christ was. That evidently turned out to be pivotal time for him. Years later, I was preaching at the Church of Christ just up the parkway from Whitney Ave. Some of the members there recalled that episode and told me some of the stories. That was so intriguing because I just happened to be reading the Hughes book at the time. I had both the written word and the abiding voice. The comparisons were interesting. Frank, I hope you blog about some of those stories some time…for historical record if nothing else. But it was a significant time for Ira. That year at Yale was when he became passionate about “liberalism” invading the church. You can read his version of the story in “Axt at the Root” (volume 1). We do need to remember the positive along with the negative when it comes to our forefathers. It is part of our own self-understanding. Whatever the faults of our forefathers in the faith, they did pass on the faith to us…imperfectly…but I pass it on imperfectly as well. We all need God’s mercy. Gardner, the politics of church are common to many of us, especially as young ministers tring to cut a place for ourselves…to find our niche. I suppose this is where experience, wisdom and some spiritual healing become important and hopefully give us some perspective. Pride, vain ambition, and comparison with others, however, is a life-long struggle…and mine continues. Thanks for your comment, and, indeed, may God have mercy. Thanks, Dottie. Your encouragement is important to me. Rex, I plan to reflect on the 1970s in terms of my own theological development in the near future. I will comment on my experience at Westminster then. I thinking of a series on something like “My Theological Turning Points”…to write about it for my own benefit and perhaps others might find some value in it as well. If you were in NE Philadelphia I’m wondering if you knew a Dan (Hudson) Large? That name does not sound familiar to me, but my memory for names is notoriously bad. No worries. I know of only one congregation in NE Philly. I’ve had family members (Woodward’s and Lau’s) attend there off and on since at least the 60’s. Thank you for sharing these and your insights. It was good to see something positive about brother Rice. I, too, had my naive run in with him and his letter to me caused me to start keeping a letter file. I had never known the details concerning his positive stands and appreciate you bringing them to light. I really appreciate this article John. Very good! On a summer afternoon in 1966 I heard Ira Rice speak at the South Hills church of Christ (Pittsburgh PA). His emphasis was on going to mainland China as a missionary, although I feel certain he included a “gospel message.” I do not use that term negatively; I don’t recall any attacks on anyone, any harsh polemics. His message moved me to desire a deeper obedience to God, and as a 15-year-old boy who had wanted to preach since fourth grade, I found myself going forward to rededicate my life and to pledge to go to China with him as a missionary. I began receiving “Contending for the Faith.” Who were these people he was writing about? What were they doing? Receiving it opened to me a new side of the Church. When I entered Lipscomb in 1969, I attended worship sometimes at Otter Creek, where John McRae preached. His messages there and at chapel pulled back another curtain, and, along with meeting and listening to Don Finto (my Bible teacher for all three freshman quarters) began to change my understanding of grace, faith, salvation, and the church. Over summer break, an issue of “Contending for the Faith” arrived that contained an attack on John McCrae’s false teaching. I was offended. I was angry. I wrote a short note to Ira telling him I wanted to cancel my subscription because of his attack on McCrae and others. The bitter anger and dislike of Ira Rice that I cultivated over my younger years has left me. As John Mark said above, I might have disagreed “with him theologically and with some of his strategies, but I can still appreciate the righteousness of some of his causes.” I still remember his pure passion for living for Jesus and taking him to China. That is a good memory. Thanks, Tim. That was helpful history and exemplary forgiveness…letting go and appreciating the good that God is doing through a person despite their defects. Wow, this is fascinating. Ira Rice Jr. was my great uncle. I only spent a short amount of time with him and don’t know much about him (hence my “Ira Rice” Google search a few moments ago), but I do remember spending time him as a 7 year old, when he was home from Russia. His sister Floy was my Grandmother. I had no idea our family had such deep roots in the Restoration movement. I admire your honesty with yourself and God’s word all these years later. I’m a young preacher and need good examples of honesty and the fortitude to go against the big name grain. sad comments; i knew ira as a young preacher and went to the lost of the pacific because of him. I will never forget him challenging his peers and shaming them in front of hundreds in Denton Tx and telling all the “hyperconservatives” they were doing nothing for evangelism!